ChainPop is a game similar to the classic Same Game but with gravity (pieces gravitate towards the center) and collision detection added for more free-form play. 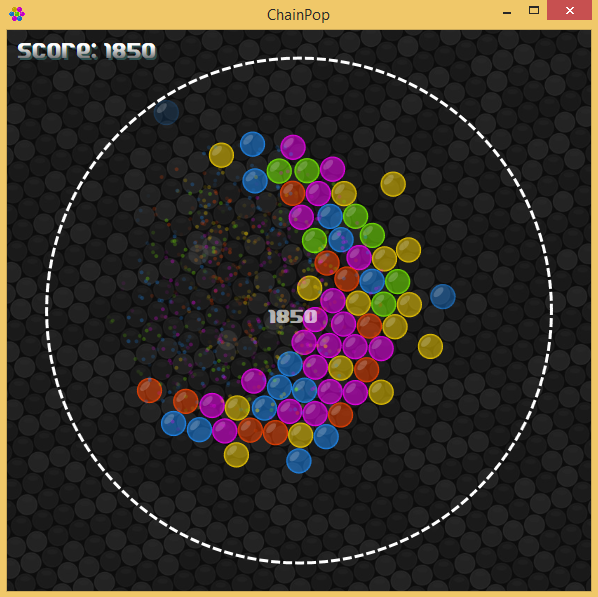 The goal of the game is to clear groups of connected (chained) colored bubbles by clicking on one in the group. As an added challenge bubbles are continously added to the playing field at an increasing rate. Once the bubbles no longer fit within the playing field the game is over. A group has to contain at least two bubbles to be cleared. Points gained from clearing these regions increase exponentially with the size of the regions. For this reason it is generally a good tactic to focus on preserving one or two colors so as to maximize the take when they are collected. Once in a while a mine bubble is spawned at the edge of the playing field. Clicking on a mine instantly clears a large number of nearby bubbles regardless of their color, this can be either a game ending or a game saving move. If a bubble is pushed of the playing field by the explosion you loose, while the large number of bubbles cleared can save you from an imminent loss. My plans for the future include converting it from a .NET/WPF/C# application and into a Windows Store App as well as improving the game flow. The rhytm of the game is rather sedate at the moment and tension builds slowly. One issue is that there are no levels in the game which instead relies on steadily increasing difficulty to built tension. This is something that I intend to experiment with changing going forward. You can download the game directly here.